This frilled lizard was drawn from life at an Australian exhibit at a local nature center. Most pictures of this species shows it in a threat mode with the frills expanded. But their normal position is folded along the neck, which reminded me of an Ancient Egyptian headdress. 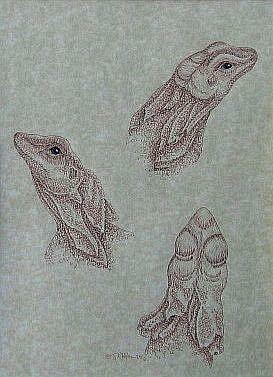 I returned to the exhibit several times, always spending the most time sketching this lizard which fascinated me. It was a good poser, holding still for long periods as it basked in it's sunlamp. I chose the medium & toned paper to resemble an antique natural history illustration. Included in the 2006 Cold-Blooded Creations Show in Daytona Beach, Florida.